Wake-ups are caffeine tablets, which help temporarily restore wakefulness when experiencing drowsiness. 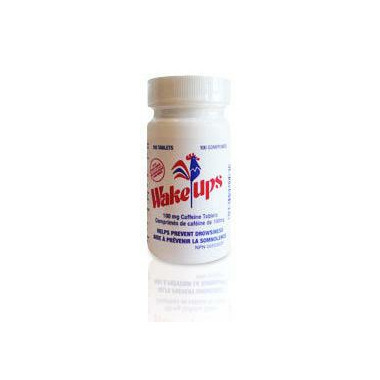 Wake-ups tablets contain 100 mg of caffeine about the same as a cup of coffee. For occasional use in adults only. Wake-ups should not be taken as a substitute for sleep. If fatigue or drowsiness persists or continues, consult a physician. The recommended dose of this product contains about as much caffeine as a cup of coffee. It is suggested to limit the use of caffeine containing medications, foods and beverages while taking Wake-ups. Ingesting too much caffeine may cause nervousness, irritability, sleeplessness and occasionally rapid heart beat. DO NOT give to children under the age of 12 years of age. As with any drug, if you are pregnant, nursing a baby, have high blood pressure or a heart condition; seek the advice of a health professional before using this product. Keep out of the reach of children. These are great to keep in the gym bag. I use them for training all the time. Easily controllable caffeine consumption without the dehydration or sugary ingredients from coffee or energy drinks. My stomach can't always handle coffee in the morning so I usually take two of these tablets. They seem to help in a pinch! Less one star because sometimes it feels like they don't work at all (but not often). They deliver 100 mg of caffeine without the cost, hassle, and yucky taste of having to choke down a large coffee. I'd take these over caffeinated drinks, any day! I don't feel like theses gave me the wake-up that a cup of regular coffee does. I felt the same after taking them. These really help counteract the grogginess without having to drink a coffee. Great for driving, convenient. They Work Great and You Don't Have To Drink A Bunch Of Coffee!!! The perfect dosage: provides energy when needed without the crash. A student's dream, a driver's life saver. Of course not to abuse, but a much better alternative to energy drinks. serves the purpose its intended for. I work night shifts and cant stand coffee, im grateful for these some nights! Works well for me. Been using for a few months now with no issues. I really like this product. I can't stand coffee but as I work in a profession where pretty much everyone ends up addicted to caffeine it is a necessity. This is a great alternative. Those do what they says, wake you up temporary but after an hour or two you feel even more tired so you really need to go to bed! Prefer this over coffee without a doubt. Does what it is supposed to do. Yep, simple. It's a convenient replacement for coffee and doesn't give you a stomach ache! It's great for people like me who don't like coffee! Take 3 of these when you wake up and it will get you through 6-2 morning shifts ahaha. Well, it's caffeine. It does what it's supposed to and it's not very expensive. I use two pills before workout. I'm not a big coffee drinker, I more a tea drinker, so it works just well. I've only used the Wake-ups a couple times, but they gave me the zing I needed to get through a long afternoon. I'm not a coffee or tea drinker, so I'm not used to consuming caffeine, so perhaps the effect would be less pronounced in someone used to chugging back several cups a day. Great for those of us who can't stand coffee but could still use the pick-me up. this product works so well, that i cut a tablet in half and take only 1/2 each day. it has helped me give up coffee that stains my teeth and contains too much sugar. the shipping was quick, the price low, i was actually able to FIND it here. i will definitely buy this product from this site again in the future. Gives me all the pep I could want every day. Love it. works great ... I have never used caffeine before these things and it made me have unlimited energy!! Can't go wrong with these. If I'm up late working towards a deadline -- these help keep me alert. I feel better just taking a couple of these caffeine pills and drinking water, than the alternatives like sugar-filled energy drinks.